This is the fourth in a series of blog posts discussing major figures in film and literature, based on the Major Arcana of the Tarot. I'll be using the 21 Major Arcana of the standard Rider-Waite-Smith Tarot deck. For some more background on the deck's history and its elusive role in popular culture, see this post from HiLowBrow, which is a good primer on the Tarot, and pretty fascinating in its own right. Glamour, that elusive quality found in the brightest lights of masscult, can only be attained in two ways. The first is that you can fake it. This is how so many young women have come to be known by the Hollywood press: from the great Marilyn to the aloof Katherine, the actresses who rose from civilian ranks have been forced to cultivate their paradoxically confident, accessible personas, to project and perform their glamour until the audience allowed itself to be convinced. They were some of the greatest actors of our time, and their greatest roles were their public personas. The second way to glamour, practiced by many of our era's great public figures of art and entertainment, is to inherit it. It passes sporadically, like a recessive gene, but if it expresses itself, it feels real, innate, and fully authentic. Paris Hilton got a kind of defective, deformed version, and it came out insipid and underwhelming. Sofia Coppola, on the other hand, one of many heirs to the Coppola showbiz dynasty, got it in just the right measure, and has spent her whole extended young adulthood making it work wonders for her (and for the rest of us, I might add). When I say she's making the glamour work, I don't mean to suggest that she's overplaying it. Sofia Coppola has capitalized on her aura of showbiz royalty through subtle machinations, alternately leveraging it and critiquing it, letting it drift off her disaffected characters like wisps of smoke, but giving them enough of a voice that they can speak from within it. All of her privileged, troubled protagonists -- Charlotte, Marie Antoinette, Johnny Marco -- wear their glamour effortlessly, and in these wayward adolescents, we find the shadow of Sofia herself. 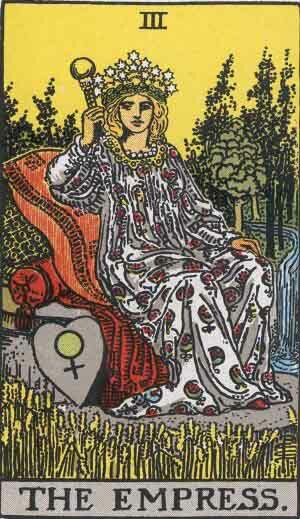 The Empress is about power, sexual magnetism, material prosperity, and good fortune, but the position is not without its detriments. Boredom, degeneracy, stagnation, and disillusionment are its natural by-products. She stands beside the High Priestess, who is grounded and interconnected, but the Empress is a vastly different creature... remote and alluring, but not warm or receptive. She has a kingdom to protect, and a reputation to uphold. She holds the royal bloodline in her hands. This has always been one of Sofia Coppola's reliable preoccupations: the turmoil of youth and freedom as it comes to terms with its family ties and responsibilities. Charlotte's hallucinatory jaunt through Tokyo, her emotional fling with an older man, are her ways of testing and defying her role as a wife. Marie Antoinette is the same, but more so: first a wife to a king, and then mother to an heir, and finally, mother to a whole kingdom that alternately idolizes and despises her. And so the Empress sees herself -- dominant, entitled, but adrift beneath her superficial claims -- and so we see her: with awe at one moment, a creature of authority and wisdom, and then as a cheap figurehead, worthy only of our jealousy and contempt.